A few Sundays back I volunteered to a be a reader in our Adult Bible Study class. The verses were familiar to me, but on this day, one of the verses resonated in a way it hadn't before. Rejoice in the Lord always. Again I say: Rejoice! That middle verse, the one about being gentle to people--all people--is giving me reason for pause, maybe a bit more than I would like. When I'm agitated with a student, a friend, my children, or even my husband, that short verse is making it's way to the forefront of my brain. It's showing up when I'm in the check-out line, or when I miss a green light because the people in front of me were looking at their phone and not the road. And then, of all places, it jumped in the car with me at the McDonald's drive-through getting breakfast when I was soon to be late for work. When it shows up, it instantly reminds me to watch carefully how the next words leave my mouth. Too bad it didn't say, "Let your gentleness be evident to people who are easy." 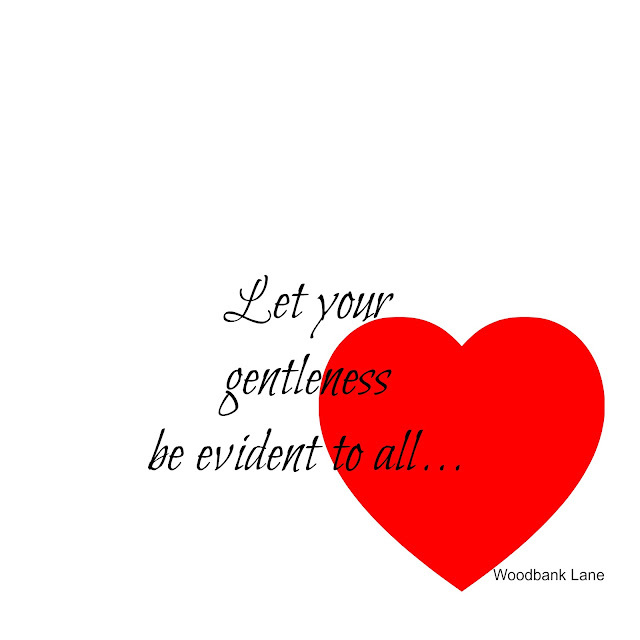 I hope my gentleness is evident to all people. May we be people who strive to demonstrate gentleness. The world could use a big dose of it right about now... Wouldn't you agree? Good verses to live by.